With the onset of winters, we see dry skin and chapped lips. Well, I need lip balms even during summers. One thing that I always carry in my bag is lip balm. I am always on a lookout for nice lip balms. 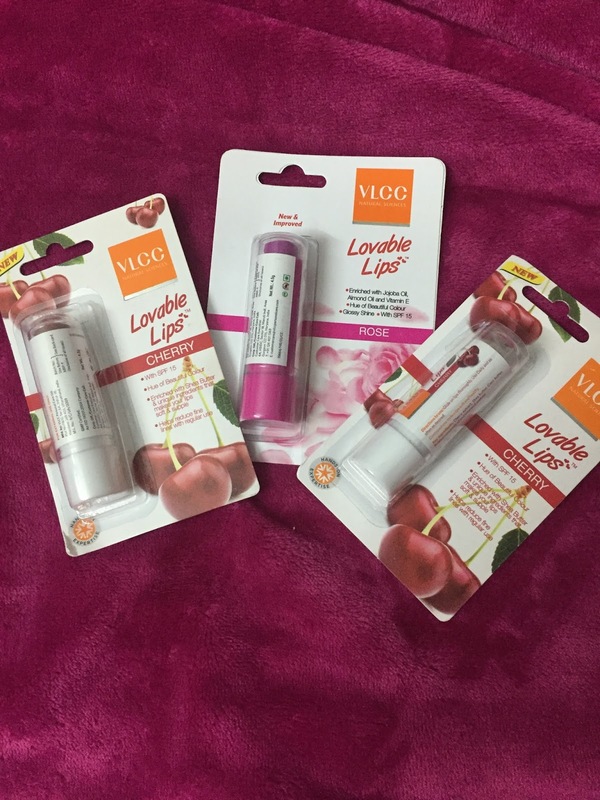 I could not resist these endearing little lip balms from VLCC. Their products are mostly good. I picked up in cherry and rose flavour. It comes in adorable outer packaging that also has detailed description of its ingredients. The rose lip balm stick is bright pink and the cherry one is white in colour. Both the sticks shut with a click. The packaging is neat but also looks cute an girlie. It can be easily carried in your bag or even your pocket. The cap of cherry balm is transparent. The cherry one has a fruity flavour and the rose has a floral aroma. They are both tinted and leave a beautiful and subtle tint in your lips. It looks so natural and nourished. The lips look shiny, soft and supple. Its texture is smooth and glides very well. The lips look beautiful- smooth and well nourished. Moisturises the lips and prevents dryness. Helps chapped lips.